42 | TH E M R EP O RT O R I G I NAT I O N S E R V I C I N G A NA LY T I C S S E C O N DA R Y M A R K E T ORIGINATION THE LATEST HUD Grants Appraisers a Reprieve FHA handbook does not require every appliance be tested during appraisals. H ome appraisers received a reprieve in the form of a clarification to FHA's Single-Family Housing Policy Handbook. When published earlier this year, the handbook contained a new requirement for appraisers to physically observe and operate appliances in a home while an appraisal was being conducted. Subsequently, realtors and apprais - ers expressed concerns that this requirement effectively turned appraisers into inspectors and ex- ceeded the previously understood appraiser duties—and that it would ultimately hurt the consumer, resulting in longer and more costly appraisals. The new guidelines clarify the requirement; in most cases, apprais - ers are now only required to make sure that certain appliances that contribute to a property's market value are physically present. "Appraisers have a lot on their plate, and their work is important to ensuring buyers, sellers, lenders and everyone else involved in a transaction has a credible source to turn to when determining the value of a property," National Association of Realtors President Tom Salomone said. "Requiring appraisers to perform duties that are better left to a home inspec - tor only slows the process while potentially adding unnecessary costs. 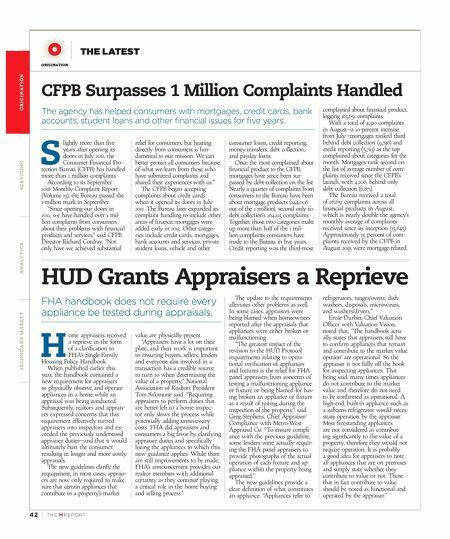 FHA did appraisers and consumers a big favor by clarifying appraiser duties and specifically listing the appliances to which this new guidance applies. While there are still improvements to be made, FHA's announcement provides our realtor members with additional certainty as they continue playing a critical role in the home buying and selling process." The update to the requirements alleviates other problems as well. In some cases, appraisers were being blamed when homeowners reported after the appraisals that appliances were either broken or malfunctioning. "The greatest impact of the revision to the HUD Protocol requirements relating to opera - tional verification of appliances and fixtures is the relief for FHA panel appraisers from concerns of testing a malfunctioning appliance or fixture or being blamed for hav - ing broken an appliance or fixture as a result of testing during the inspection of the property," said Greg Stephens, Chief Appraiser/ Compliance with Metro-West Appraisal Co. "To ensure compli - ance with the previous guideline, some lenders were actually requir- ing the FHA panel appraisers to provide photographs of the actual operation of each fixture and ap- pliance within the property being appraised." The new guidelines provide a clear definition of what constitutes an appliance: "Appliances refer to refrigerators, ranges/ovens, dish - washers, disposals, microwaves, and washers/dryers." Ernie Durbin, Chief Valuation Officer with Valuation Vision, noted that, "The handbook actu - ally states that appraisers still have to confirm appliances that remain and contribute to the market value opinion' are operational. So the appraiser is not fully off the hook for inspecting appliances. That being said, many times appliances do not contribute to the market value and therefore do not need to be confirmed as operational. A high-end, built-in appliance such as a subzero refrigerator would neces - sitate operation by the appraiser. Most freestanding appliances are not considered as contribut- ing significantly to the value of a property, therefore they would not require operation. It is probably a good idea for appraisers to note all appliances that are on premises and simply state whether they contribute to value or not. Those that in fact contribute to value should be noted as functional and operated by the appraiser." CFPB Surpasses 1 Million Complaints Handled The agency has helped consumers with mortgages, credit cards, bank accounts, student loans and other financial issues for five years. S lightly more than five years after opening its doors in July 2011, the Consumer Financial Pro - tection Bureau (CFPB) has handled more than 1 million complaints. According to its September 2016 Monthly Complaint Report (Volume 15), the Bureau passed the 1-million mark in September. "Since opening our doors in 2011, we have handled over 1 mil - lion complaints from consumers about their problems with financial products and services," said CFPB Director Richard Cordray. "Not only have we achieved substantial relief for consumers, but hearing directly from consumers is fun - damental to our mission. We can better protect all consumers because of what we learn from those who have submitted complaints and shared their experiences with us." The CFPB began accepting complaints about credit cards when it opened its doors in July 2011. The Bureau later expanded its complaint handling to include other areas of finance; mortgages were added early in 2013. Other catego - ries include credit cards, mortgages, bank accounts and services, private student loans, vehicle and other consumer loans, credit reporting, money transfers, debt collection, and payday loans. Once the most complained about financial product to the CFPB, mortgages have since been sur - passed by debt collection on the list. Nearly a quarter of complaints from consumers to the Bureau have been about mortgage products (244,008 out of the 1 million), second only to debt collection's 264,123 complaints. Together, those two categories make up more than half of the 1 mil - lion complaints consumers have made to the Bureau in five years. Credit reporting was the third-most complained about financial product, logging 163,651 complaints. With a total of 4,310 complaints in August—a 10-percent increase from July—mortgages ranked third behind debt collection (9,746) and credit reporting (5,723) as the top complained-about categories for the month. Mortgages rank second on the list of average number of com - plaints received since the CFPB's launch, with 4,206, behind only debt collection (6,871). The Bureau received a total of 28,651 complaints across all financial products in August, which is nearly double the agency's monthly average of complaints received since its inception (15,845). Approximately 15 percent of com - plaints received by the CFPB in August 2015 were mortgage-related.